sets fire to the rest of the house "to match"
"sister" she says, and "mine,"
so you have to sit on the floor. Kathrin Köhler is a recent graduate of the Odyssey Writing Workshop. She lives in Madison, WI where she attended university and currently drives a cab when not writing or reading. Her interests include exploring paradigms of power structures and social organization; the role of narrative in creating reality; how various forms and genres evoke, and allow us to contemplate, the nature of humanity. Kathrin's poetry has appeared or is forthcoming in Interfictions, Strange Horizons, Goblin Fruit, and Stone Telling, among others. 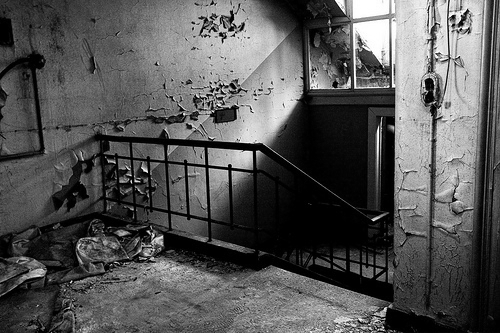 Photography: adapted from Urbex House…, by Elvin.